Tara Mathew Ministries provides a number of powerful resources for your church! Book Tara to speak and sing at one of your services. Tara is a very gifted speaker as well as a talented singer and regularly leads services at churches across the the country. she spent as a missionary in India working with YWAM. Tara has a moving testimony telling how sacrifice and obedience to God's word can bring on incredible life changing opportunities. Tara is available to appear solo, singing and playing piano or performing to backing tracks, or with a full band depending on your requirements. Tara is a regular performer at the International and Regional Christian Resource Exhibitions and brings a very special minisrty to larger events. She can speak and perform either solo with a piano or backing tracks, or with a a full band and can also incorporate multi-media presentations if appropriate. 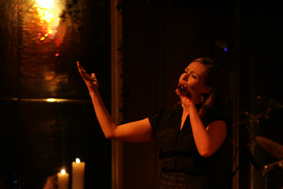 Tara has appeared alongside people such as Pam Rhodes, Dianne-Louise Jordan and Adrian Plass and is the ideal choice for fund raising events at which she often performs. For one Christian charity, she wrote a song specifically for the dinner event which helped to raise over £50,000 on the night! Check out more resources from Tara Mathew Ministries at the Resource tab in the navigation menu above!